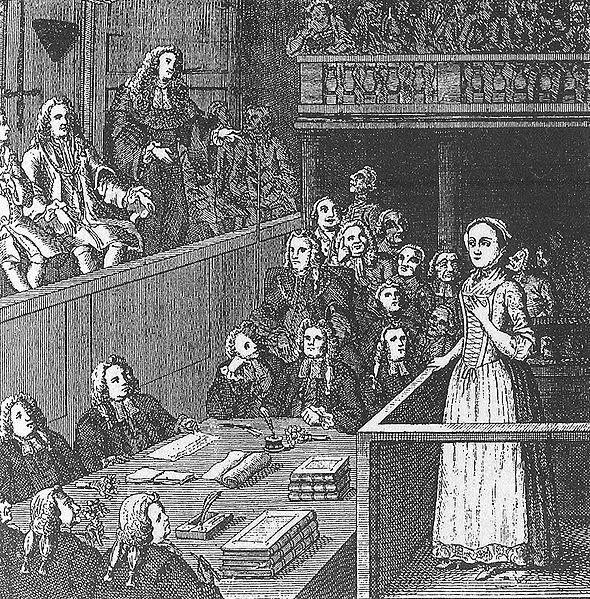 Old Bailey records show that while living in Aldermanbury, Sotherton became involved in one of the most notorious criminal cases of the time, giving evidence in 1754 about his attendance the previous year on servant girl Elizabeth Canning, who had claimed to have been kept prisoner for a month in a house of ill repute in Enfield. Her evidence had caused her supposed abductor to be sentenced to be branded and imprisoned, and another defendant to be sentenced to hang for stealing Canning’s stays – she was subsequently pardoned. The case had generated huge controversy, not least in the notorious Grub Street Press, and in 1754, after investigations by Sir Crisp Gascoyne, Lord Mayor of London, Canning herself was tried and convicted for perjury, and was transported to America. The truth of the case was never determined for certain, but some said that Canning had arranged a disappearance to mask an unwanted pregnancy. Mr. Backler, an apothecary in Aldermanbury, deposed, he was applied to by the girl’s mother, and went to her on the 30th of Jan. he found her extremely low and could scarcely hear her speak, with cold clammy sweats in her bed, complained of being very faint and sick, and of pains in her bowels, and of having been costive the whole time of her confinement; he ordered her a purging medicine, but her stomach was too weak for it, and could not bear it; he then ordered her a glyster that evening, and on the 3d of February another, the latter had some little effect; he ordered her another on the 5th, that had no effect at all: and she continuing very bad and in great danger, Dr. Eaton was sent for on the 6th; he wrote prescriptions for her for fourteen days, of diuretics and gentle cathartic medicines; that she was tollerably well in about a month. When she was at the worst her face was remarkable, her colour quite gone, her arms of livid colour spotted: and that when he heard she was gone to Enfield-wash, when the people were taken up, he thought her not able to perform the journey, and thought it extremely improper for her to undertake it, she being very much emaciated and wasted.